According to the National Research Council, the use of Embedded Systems throughout society could well dominate previous milestones in the information revolution. Mechatronics is the synergistic combination of electronic, mechanical engineering, controls, software and systems engineering in the design of processes and products. Mechatronic systems are putting “intelligence” into physical systems. Embedded sensors/actuators/processors are integral parts of mechatronic systems. On the one hand, implementation of the mechatronic systems is on the continuous rise. On the other hand, manufacturers are working hard to reduce the implementation cost of these systems while trying not to comprise product quality. One way of addressing these conflicting objectives is through automatic controls and virtual sensing. The first part of this presentation discusses the tradeoff between battery degradation and energy consumption and how advanced control concepts can be used to minimize this tradeoff. A new aging-aware energy management system will be introduced and the applications of this strategy will be discussed, including its application to an electric powertrain with both lithium-ion battery and ultracapacitor energy storage. The second part of this presentation discusses the design of virtual sensors for feedback control applications. A new mathematical (estimation) technique based on the Youla parameterization utilizing Controlled Output Observer framework, for designing virtual sensors, is introduced. Several practical examples, including developing an adaptive sensor fusion technique for autonomous vehicles, about the effectiveness of this methodology are presented. 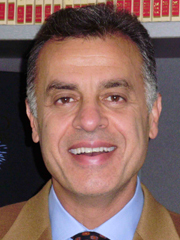 Prof. Francis Assadian is a Professor in system dynamics and control in the department of Mechanical and Aerospace Engineering at the University of California, Davis. His expertise includes vehicle dynamics, active chassis development, alternative powertrain, bond graph modeling and energy optimization of dynamic systems, and estimation and advanced control system design. He was previously head of the department of automotive engineering at Cranfield University in the UK. He has over 25 years of industry experience of which 17 years are in the automotive domain. He worked for companies such as Peugeot-Citroen in France, Ford of Europe in Germany, and Jaguar Land –Rover in the UK. He has published over 100 journal and conference papers. He is a registered Professional Engineer in the State of California and a Certified Engineer in the UK and a Fellow of IMechE. He is also named as an inventor on 4 European and 2 US patents.